The Shroud of Turin, a linen cloth with the image of a man who has suffered physical trauma consistent with crucifixion, will be on display today on television and using an app as a parting gift from Pope Benedict XVI. It is kept in the royal chapel of the Cathedral of St. John the Baptist in Turin, Italy. Although it has not been endorsed by the Catholic Church, it is one of the holiest relics of the Catholic Church. Tradition is that the 14-foot-long linen cloth wrapped Jesus Christ’s crucified body. It is covered in bloodstains, dirt and water marks and displays an actual imprint of a man’s face. The authenticity of the Shroud is disputed. In 1978, carbon dating placed the date between the 13th and 14th centuries. The testing was disputed, however, because contamination was alleged to have occurred when repairs were made during the medieval period. 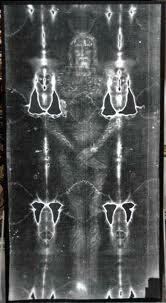 A recent book, “The Mystery of the Shroud,” dates the shroud between 280 BC and 220 AD based on single fiber analysis. Pope Francis will appear on Italian TV on Holy Saturday to introduce an RAI Uno TV broadcast of the shroud. Shroud 2.0 is a free Apple app by Haltadefinizione is based on photos on photos taken in 2008. They announced yesterday that the Shroud is from the time period when Christ lived. It is not from the 13th or 14th century. At least that has been confirmed.